Here are more pieces from the “Blockhead” series. A particular type of development is happening, mentioned in the last posting: taller pieces, all black and white, more eccentric shapes, and more variety in body types, more variety in line quality. This may have been the first “Blockheads” piece. I had already begun making the prints and I wanted to try out the same imagery on some clay pieces. The approach is different regarding prints vs clay - the clay is always loser and more spontaneous. This may be the second “Blockheads” vase. 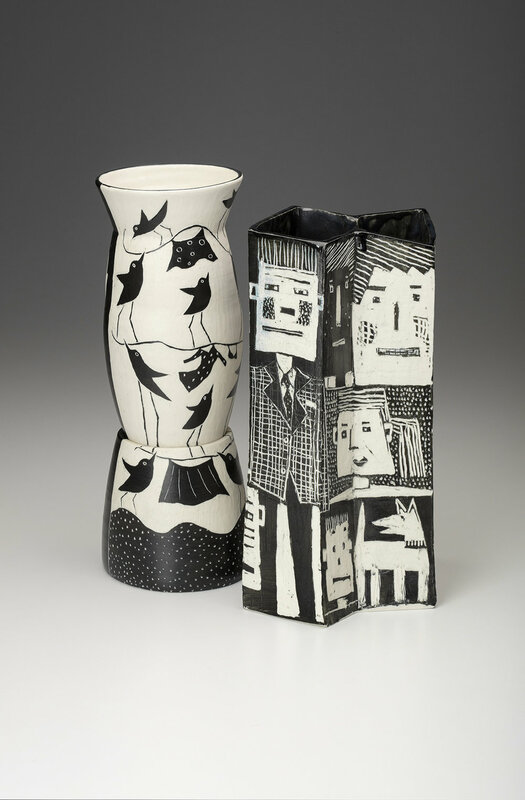 The changes that begin to happen are that the vases become more complicated in form and there continues to be experimentation regarding the best color to black and white ratio. The images are still very loose. This piece becomes a complete black and white piece and there is a lot more variety in the shape of the piece and the types anad sizes of images used on the surface. Fran and I had some new work photographed by John Polak yesterday. As always it was a great experience - chatting about news, the summer etc. but also being able to see our work through the eyes of a professional. I will be adding photos little by little on this site, spreading out the images. 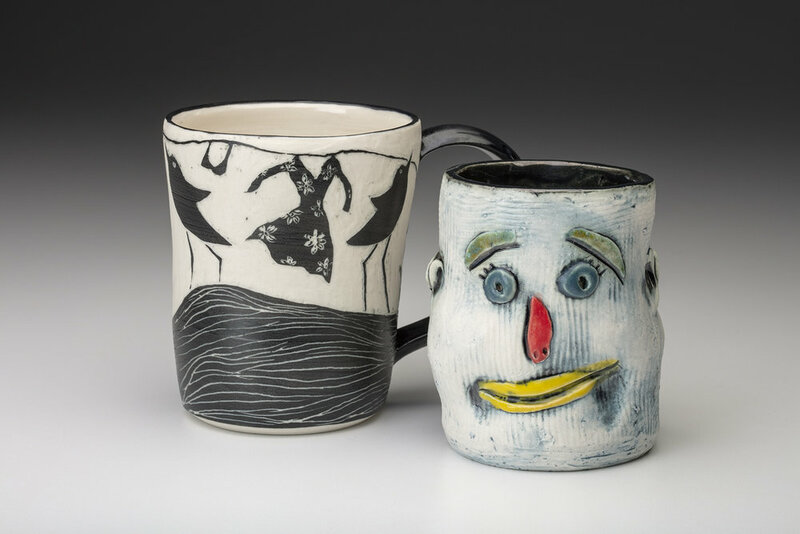 I chose to have the Blockhead ceramics photographed. Fran had a new plate photographed. Some of the photos were intended for the upcoming publicity associated with the Pottery Trail. We usually have two of our pieces positioned next to each other either in real space or a cut and paste in a horizontal and vertical format. One of the images was our traditional “two cups” shot in which two of our cups are juxtaposed as an example of what happens in the studio. I was surprised at how well this worked. We usually use this image for our own sales and publicity. The other combination. It is interesting to see similarities of forms in our work. The shape of the yellow lips and the marks of the landscape are almost identical. Latest version of the next Blockheads. I am getting the registration I want in this print but I notice that some of the earlier prints in the series were more easily read and understood with less activity. I am beginning a new print in oil ink and will see if I can can color/accuracy of registration/ less activity to come together. Some similar information: edition of @ twelve and 12" x 16". Taken this morning in the Office room - an under-view of a laundry line of drying prints. I used Caligo inks on these prints and have at least five layers/passes on each, consequently these are taking forever to dry completely. They will remain in this situation until they aren't tacky to the touch anymore. Don't know when that will be but currently they are out of the way and I can ignore them. The prints don't stain or smear when touched but they "stick" together when stacked on top of each other, making a very scary noise when separated. This happens even with a separator sheet in between each print. This is an image of the finished ceramic pediment on our bathroom edition. The change from the last image posted here is the dramatic wooden framing. It has been fun to live with this piece. It was a good experience for many reasons. This isn't the first time we made a piece that required a lot of attention to math and calculating shrinkage but it was very satisfying, when the piece was completed to know that it "fit" the required size. We also hemmed and hawed about whether we should glaze the piece or not. One piece cannot do everything so we are both glad that we opted for "subtle" rather than a dramatic color, surface or contrast of color. One thing that is worth thinking about is scale. While the images seem big up close, they are very small and detailed when seen from a distance. making greater allowances for the Size vs. Distance relationship may be considered differently the next time around. The most "telling" part of all of this will be Winter. We will watch the piece carefully to see how it weathers. We do live in New England. The generous overhang should alleviate almost any problem - it prevents any rain from coming in - but one can never tell. This is the next layer of the linocut. I think that I will add one more color to this, either yellow, red or orange....we'll see. I think that color will be the last layer. Here is another Blockheads print in progress. Only two colors have been printed. There may be as many as three more. It also is 12” x 16”. I continue to use Caligo inks and am happy with the results but they take forever to dry. This is an early morning photo of a new porcelain pediment that was just installed yesterday on our new addition. The piece is carved porcelain, @ 7 ft at the base. Decorative and functional wood trim will be applied to the border shortly. We thought about all types of finishes for the piece such as multi-colored images to Wedgwood figure/ground solutions and settled on simple bas-relief. One nice thing about the piece is how it is very subtle. It is on the second floor, pretty high up. It is integrated nicely with the house without calling too much attention to itself. The imagery comes from Francine's work: the laundry line, boat, flowers, ceramics, piled rocks and, of course, busy birds. The piece will look different in every season. I think it will be most dramatic when the sun is lower (winter) and in fall and spring. With the sun being so high in the summer, a lot of shadow falls over the piece from the generous overhang. We will post other pictures at different times of year to see if this is true. It was enormously fun to do. We will see how it lasts through our weather. I have been working on two pieces for a while, a waste block linoleum cut ( the next in the blockheads series) and another "Studies" of imaginary vases linocut. The reduction linocut, Blockheads, is very close to finished. I just cut the block for the last color. I have been waiting for the ink to dry between each printing and the drying has taken longer than expected. The last Blockheads linocut still remained tacky for a while even after it had been completed for at least a week. This type of slow progress is very different from the more immediate results that comes from monoprints. I know I do not like the lack of production but I have enjoyed learning in the waste block process - my technical skills are growing with each new print. The other print I am working on is a one-color vase study and it is almost completed. The images included in this blog are definitely works in progress. I shot this image early in the morning with the block covered with tools and crumbs. This print should be completed soon. One interesting technical observation is that the two linoleums are from different companies. One is harder, the other softer to cut. I'm still thinking about the advantages of one verses the other. The blockheads are on an inch high block that most easily works with the letter press at Zea MAys where I print them. The thinner block is printed at home the old-fashioned rubbing by hand method that seems to be more reliable than using a studio press. The mounted blocks are expensive but easier to print multi colors. The unmounted blocks are more difficult to register for more than one color. another look at this block. This piece, like the first "Studies" is 18" x 24"
This is a large vase and flower study, pen and ink on paper. 40 images on 36" x 22" paper. This is a mixed media "Vessel Studies" drawing. It has a number of layers using inks and acrylics. This is my latest linocut entitled "24 Studies of Vases and Flowers". It is 18" x 24" , printed in an edition of ten. We both were juried into the "Fifth Annual Juried Show" sponsored by our local Amherst gallery, Gallery A3. Frank submitted one of his new Blockhead linocuts and Francine submitted a new, "Birds at Sea with Laundry" plate. The opening is this coming Thursday, June 7th, 5-8 pm. We enjoyed watching the movie, "RBG", not too long ago; but our enjoyment was increased when, in more than a couple of scenes, RBG herself is shown using some of the cups that I sold her in the Smithsonian Craft Show many years ago. I still remember the moment of her unexpected appearance in my booth, dwarfed by her secret service bodyguard. The Honorable Justice said that she was tired of using cups from her alma mater and wanted something different. I will always be grateful that she bought a good selection of my work and, as the movie shows, she continues to use them in her daily life. The movie was a great reminder of my "meeting" Justice Ginsburg and seeing how my work is used by all types of people. I just finished a new "Blockheads" linocut. I am getting better at the process of lining up each new layer. I enjoy using the waste block technique but one pays a heavy price if you slip up in lining up the layers. This new "Blockheads" is better technically than the first one and I am looking forward to the next one in which I completely use a printing technique using Quoins to lock the block in place for the entire printmaking session. This print is 9x16 and five layers of color.